Columbia, Mo. (May 3, 2017) — KBIA-FM, Columbia’s listener-supported NPR-member station, won two 2017 National Headliner Awards. 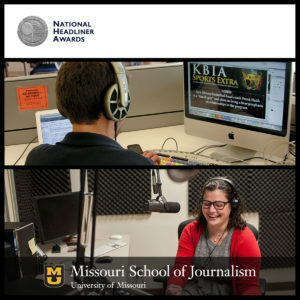 At KBIA, Missouri School of Journalism students produce stories with audio, video and text for the station’s website while also producing traditional radio newscasts and long-form stories. Founded in 1934 by the Press Club of Atlantic City, the National Headliner Awards program is one of the oldest and largest annual contests recognizing journalistic merit in the communications industry. The first National Headliner Awards were presented in 1935. Since then, more than 2,000 Headliner medallions have been presented to outstanding writers, photographers, daily newspapers, magazines, graphic artists, radio and television stations and networks, and news syndicates. At KBIA, students produce stories with audio, video and text for the station’s website while also producing traditional radio newscasts and long-form stories. Therefore, these two are prestigious and meaningful awards for KBIA. “We are the smallest market in the country that wins the awards,” said KBIA’s General Manager Mike Dunn. “Mizzou at a Crossroads” is an in-depth analysis on the history of race relations at the University of Missouri, the efforts to start conversations about race on campus, the process behind hiring former University of Missouri System President Tim Wolfe, and an overview of what might be in store for the future of UM leadership. Every professional member of the KBIA news staff contributed reporting to the project. Famuliner said it was a true hands-on teaching project, as students worked alongside out professional reporters on this in-depth report. Graduate student Guimel Sibingo co-reported part three of the series, and Emerald O’Brien, Ryan Levi and Rodney Davis also contributed. A handful of convergence journalism students also assisted with production tasks on the project. “The Missouri Method was strong on this one,” Famuliner said. “An Uncertain Road: Life after Premature Birth” was a series by KBIA reporter Rebecca Smith, who is one of two reporters on the grant-funded Health and Wealth Desk. Her series explored the nuanced reality of premature birth through compelling stories of Missouri families who have been through the experience, including her own family. Both series were published online using an interface created by KBIA’s digital content director Nathan Lawrence. Both Smith and Lawrence also instruct students in the KBIA newsroom and teaches a section of a convergence multimedia class at the School of Journalism. KBIA has served mid-Missouri since 1972. The station is a university-licensed, community-supported not-for-profit institution, actively involved in the life of the mid-Missouri area. The station is the area’s largest provider of arts programming, serving more than 30,000 listeners and members each week.